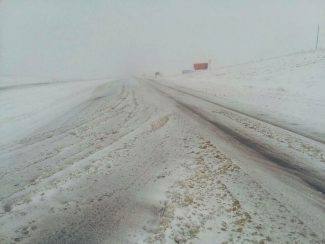 Road conditions in western SD are very hazardous and it is only getting worse! Please stay home if possible! A potent spring storm that is unleashing heavy snow from the Rockies to the Plains and Upper Midwest will also continue to lash the region with fierce and potentially damaging winds into Thursday. The storm blasted parts of the West with heavy rain, heavy mountain snow, power-cutting winds and blowing dust on Tuesday with more on the way into Wednesday night. The early stages of the storm knocked out power to 50,000 in the Los Angeles area and kicked up dramatic dust storms in Nevada. AccuWeather meteorologists say strong and locally damaging winds will develop as this storm system deepens, bringing near-blizzard conditions to the north and northwest of the storm system with a high fire danger for portions of New Mexico and Texas. Travel impacts on the air and ground are already being reported and will only grow larger as the storm strengthens. Delta and Southwest airlines have issued travel waivers for certain cities in the path of the storm. The same storm will also bring a risk of severe weather to the heartland, including areas hit hard by flooding in recent weeks and other areas that are currently experiencing flooding from the Mississippi River. Snow is causing travel delays and disruptions in southwestern Minnesota. "Expect slick, icy conditions in some areas of SE Minnesota as the snow falls," Minnesota Department of Transportation, District 6, said in a tweet on Wednesday morning. Extreme fog is reported in the Colorado Foothills above Denver, Colorado, ahead of blizzard. The incoming storm has prompted several school closures and delays in the Denver area. Snow is causing travel issues across South Dakota this morning. Noem ordered the closure of state government offices today in 52 South Dakota counties due to weather. South Eagle Butte, South Dakota, has reported 10 inches of snow already. There have already been reports of thunder and lighting along with snow in the state this morning. Several motorists have been stranded and needed assitance from law enforcement. South Dakota Gov. Kristi Noem has closed state government offices in 52 counties. Numerous schools around the state have closed on Wednesday. "People are being urged to stay home and not travel unless absolutely necessary," South Dakota Department of Public Safety said in a tweet early Wednesday morning.